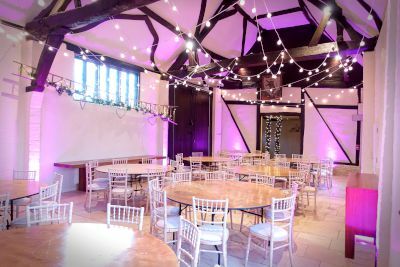 The Carriage Barn at Nether Winchendon House has gorgeous dark oak beams contrasted against white painted brickwork, which make it a wonderful blank canvas for hanging a light canopy overhead and highlighting the texture of the walls with LED uplighters. ...changing to pink at the touch of a button! 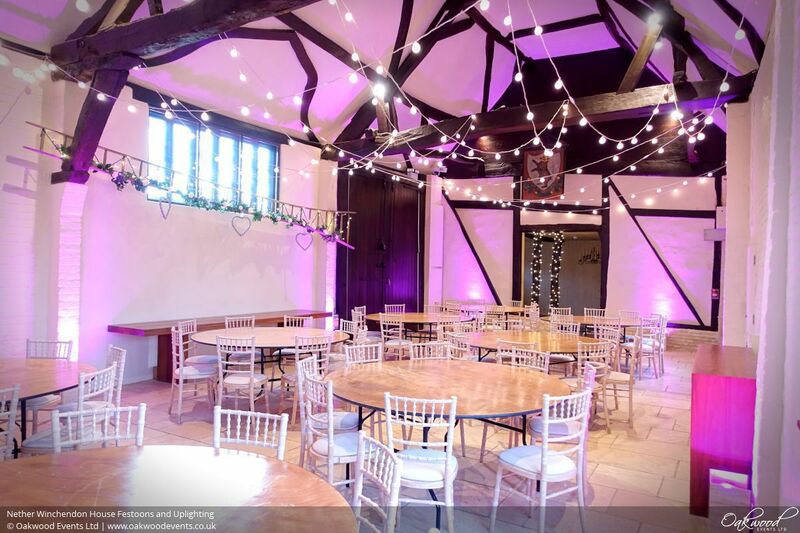 For this spring wedding we worked with the couple to design a lighting scheme that would make the most of the venue's existing features while creating a relaxed, comfortable atmosphere with the option to introduce some colour to change the mood in the evening. Together we settled on a hanging canopy of looped festoon lights overhead and controllable LED uplighters around the walls. Taking advantage of the beams, the festoon canopy covered the full length of the main barn. 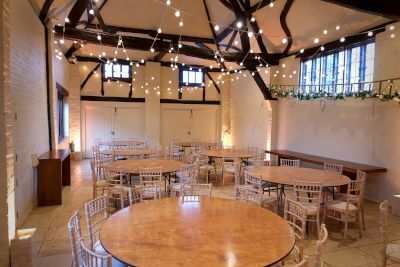 A perfect match for the feel of this amazing barn, the festoons were both pretty and practical, helping to light the room with a soft, warm glow from top to bottom. Filling in around the walls were a set of controllable LED uplighters to give a cosy glow during the day followed by a party atmosphere for the evening's dancing. In these photos the lights are first gold then pink, but they can easily be set to any of a wide range of colours. Both the festoon light canopy and the uplighters were dimmable, and the uplighters were supplied with an easy to use controller so that any colour, or a colour-change mode, could easily be selected at any time. The lights integrated seamlessly with the venue's existing lighting fixtures, allowing for lots of different options ranging from brightly lit and functional, to soft and cosy, to party mode! There are lots more ideas for decorative lighting at Nether Winchendon House on our main Nether Winchendon House Lighting page. 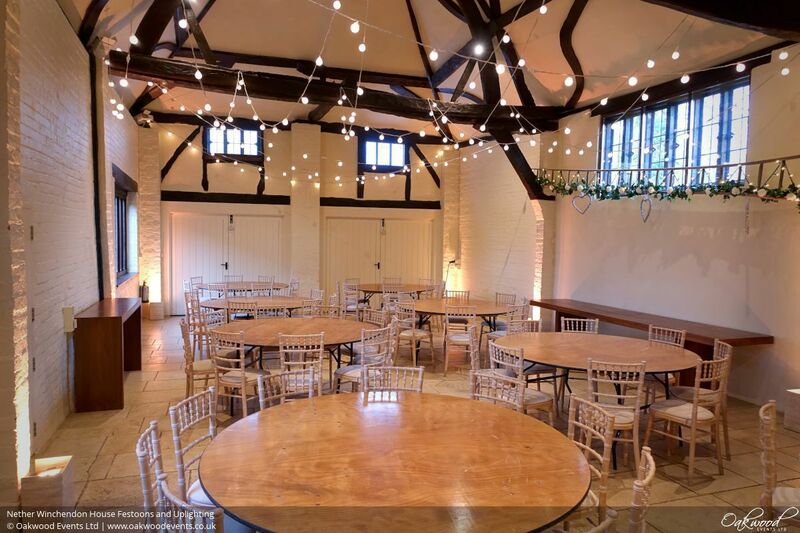 Just wanted to thank you again for the beautiful lighting you put up in Monks Barn in April for our wedding. The pictures look absolutely stunning, it was such a beautiful day.